Private John Bembridge was born in Carlton Scroop in 1897, son of William & Martha Bembridge. He was living at Carlton Scroop and working as a farm horseman when he enlisted in the Lincolnshire Regiment in May 1916 at Grantham, aged 18 years, 6 months. Initially he served on the reserve before being mobilised on 14 Sep 1916. He signed up for the duration of the war. He was 5ft 3 1/4” tall, with a 36” chest, religion Church of England. 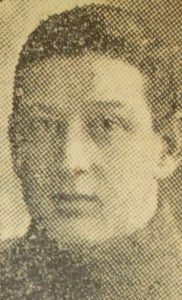 He was initially posted to 3/3rd Bttn Lincolnshire Regiment but on 5 Dec 1916 he transferred to 5th Battalion, Machine Gun Corps. On 2nd March 1917 he sailed from Folkstone to Boulogne to join the British Expeditionary Force. The following day he arrived at the Machine Gun Corps’ Base Depot at Camiers before joining 137th Company in the field on 17th March. During 1917 he was admitted to the field ambulance with tonsillitis twice and once to hospital with scabies. He had leave in UK 22 Jan – 5 Feb 1918. A few weeks later (16th Mar 1918) the company became 46th Bttn. Machine Gun Corps within 46th (North Midland) Division. He was killed in action on 13th Sep 1918.